Need a ride? Ordering an Uber? Well in 2020 in Dallas, you may have to look ‘up’ to find your driver! Uber announced at its Elevate Summit last week, that it has struck partnerships with the cities of Dallas and Dubai to demonstrate a network of flying cars by 2020. Ross Perot Jr.’s development company, Hillwood, will build vertiports for the flying vehicles in “hubs of activity” like Arlington’s entertainment district and the American Airlines Center. 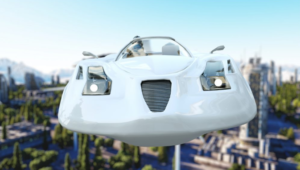 The company also announced a handful of partnerships with aviation companies to develop and deliver a flying car. Called the Elevate project, Uber believes that investing in flying cars is essential to protecting its business. Uber envisions full-scale operations of a flying car network launching in 2023. “If you’re not planting the seeds for 5-10 years out, you have no company in five to 10 years,” Uber chief product officer Jeff Holden. Ambitious? Yes, very. The kind of aircraft Uber envisions shuttling customers through the air—electric, with vertical takeoff and landing capability, and capable of flying 100 miles in just 40 minutes—don’t exist yet, nor does the infrastructure needed to support them. Once built, the FAA, must ensure these aircraft meet all federal safety regulations and figure out where and how they fit into a complex air traffic control system. As crazy and ambitious as this all sounds, Uber and it’s partnering companies can make this work. “I think 2020 is realistic for a vehicle that is not replacing an airplane but replacing a car,” says Richard Pat Anderson, director of the Flight Research Center at Embry-Riddle Aeronautical University. A purely electric aircraft might remain elusive, but a serial hybrid setup—where the aircraft carries a fuel-burning turbine to keep the juice flowing, much like the Chevrolet Volt—could work. Aware that its existing business could be disrupted by autonomous vehicles, Uber expects flight to be become a daily part of our transportation lives. The company believes it can offer rides in flying cars for about the same price as an UberX ride. The technology could be transformative in areas plagued by traffic. In October, Uber released its ambitious vision for how flying cars, technically known as vertical takeoff and landing vehicles (VTOL), could make transportation incredibly fast and cheap. The technology is also largely unproven. Many hurdles remain to making flying cars safe, affordable and reliable. There will be regulatory questions to answer. As for the cities, no surprise Dubai is interested. The city’s general attitude towards tech is, “Looks shiny, we’re in!” It wants to equip firefighters with jet packs, and it will be home to one of the first hyperloop tracks. Flying cars clearly fit right in. But it doesn’t hold a monopoly on the future. Texas wants in, too.